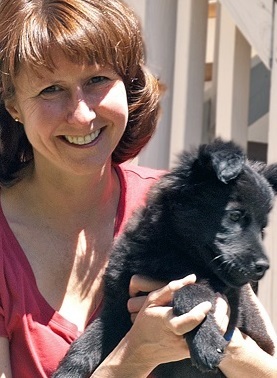 Lisa Lunghofer, executive director of Making Good Work, has devoted the past 20 years to development and evaluation of programs in the areas of child and family well-being, family violence prevention, animal welfare, and the human-animal bond. Lisa currently serves as principal investigator for an Office of Juvenile Justice and Delinquency Prevention (OJJDP)-funded study to test the effectiveness of a Girls Inc. substance prevention program. She is also evaluating the effects of training and adopting shelter dogs on veterans suffering from PTSD. In her preliminary findings, Lisa writes: “almost every one of those respondents said that the best thing about having their dog was love… never underestimate the profoundly healing power of the relationship between a hurting person and their dog – the power of love.” She is also co-evaluating the Children and Animals Together (CAT) program, which is designed to help young children who have abused animals, with its developer at Arizona State University. director of an initiative with the National Technical Assistance and Evaluation Center designed to help communities develop systems-of-care to improve outcomes for children and families at risk of, or suffering from, maltreatment. project manager for the National Evaluation of Safe Start, an OJJDP-sponsored initiative to prevent and reduce the impact of family and community violence on young children. a task leader on the National Survey of Child and Adolescent Well-Being, the first national study examining characteristics of children and families in the child welfare system and the relationship among those characteristics, services received and outcomes. project manager of a National Institute of Justice-sponsored evaluation of sexual violence/harassment prevention programs in middle schools.